Today is Баба Марта which is a holiday celebrated on 1st March in Bulgaria. The holiday is about welcoming the spring and saying goodbye to the winter. It is one of the oldest pagan rituals celebrated in Europe, despite a large number of Bulgarians identifying themselves as Eastern Orthodox. 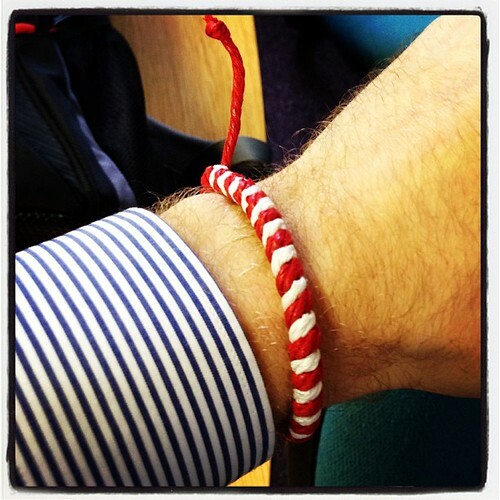 One of my colleagues in Sofia has kindly given me a мартеница (Martenitsa) to wear which is part of the tradition. Apparently I need to wear this until I see a stork or a blossoming tree. The red represents life and birth. The white represents a fresh start. Similarly Mărțișor is celebrated in Romania. Posted in Travel and PlacesBookmark the permalink.